Nothing says Fall like colorful leaves and breezy cool days. 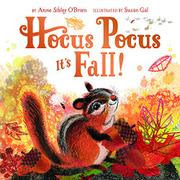 Anne Sibley O'Brien and Susan Gal team up again (Abracadabra, It's Spring) to bring the joys of the Fall season to life. Fall is a season of transition, with changes often catching us by surprise. With eleven gatefolds, the book mimics these surprises and invites readers to guess at how each change as summer moves toward winter. Plants release their seeds, geese and ducks begin to fly south, leaves change color, and squirrels store nuts for the winter. Humans prepare in other ways: heading back to school, wearing warmer clothes, and harvesting apples. O'Brien captures these signs of fall with easy-to-follow rhymes and magical exclamations at each new sight. With vibrant colors, Gal's illustrations showcase the quintessential colors of autumn while depicting an array of animals and people preparing for colder weather. Reviewing this book today actually put me in the mood for some vegetable beef soup. In South Carolina today, we are dealing with the monstrous effects of Hurricane Matthew as it slowly moves up the coast. The few leaves that have begun to change are being blown off their trees, and with the cloud cover, one would swear it's about 60 degrees outside. Alas, it's a balmy 76 degrees, but I'm still going to fix some soup! Tomorrow, I head to North Carolina to pick out the perfect pumpkin and indulge in some apple cider. This book couldn't have put me in a better mood! The children in the book are adorable, and kudos to O'Brien and Gal for including a diverse set of kids so that every child can relate to a character. From the gatefold of the school bus to the annual harvest, Gal chooses the perfect tones to reflect the season. Young readers will love the continuation of the magical greetings, and opening a gatefold is always fun. Curl up with your young reader with some hot chocolate (or a PSL) and sink into the sounds and sights of Fall.